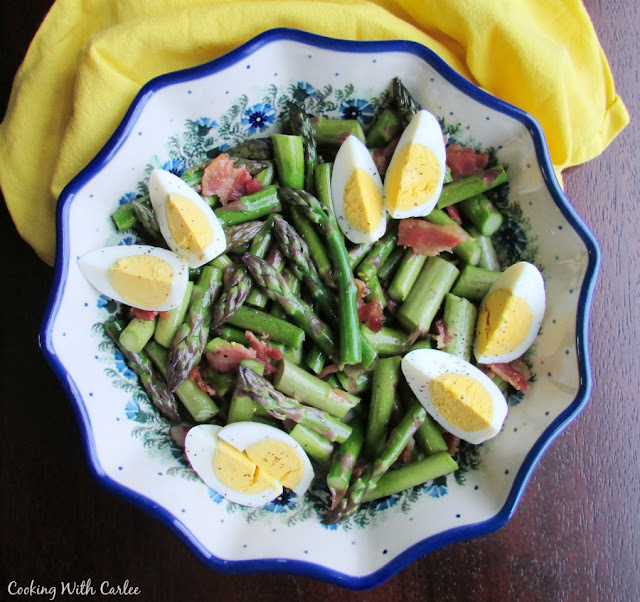 This simple salad showcases fresh spring asparagus with a simple dressing, some bacon and eggs. It is a great way to celebrate the simplicity of spring. One thing I always look forward to as spring rolls around is fresh asparagus. It is so good and so much better when it is in season locally. I love it roasted so much that I normally make more than my fair share of it that way. Of course I grill a bunch or two and usually end up with some in a cheesy tart but a good ninety percent of the asparagus I buy ends up tossed in olive oil, dusted with salt and pepper and roasted. This year I vowed to try a few new things and I am so happy I did. The asparagus we had in our Parmesan Polenta Brunch Bowls was so delicious. I loved it, but I wanted to push the boundaries a bit further. I couldn't think of a time I had made an asparagus salad, so I thought I'd give it a try. I riffed on a few of my other favorite spring salads. I love a good spinach salad with eggs and bacon and that slightly sweet dressing. I also love wilted lettuce this time of year with those same flavor profiles. So I thought it would be fun to play with those flavors and asparagus. Rather than using ketchup or sugar for that bit of sweet, I added a few drops of maple syrup. There is nothing that can replace that good old bacon flavor, so I crumbled up some of the good stuff. And speaking of good stuff, I happened to have some of MiMi's farm fresh eggs in the refrigerator. This salad pretty much built itself from there. My husband was skeptical at first. Room temperature asparagus topped with hard boiled eggs seemed a bit foreign. However two bites in and he was on board. I love that even when he isn't so sure he is honest enough to tell me but also open minded enough to try it anyway. He usually never minces word, so he is handy to have around. 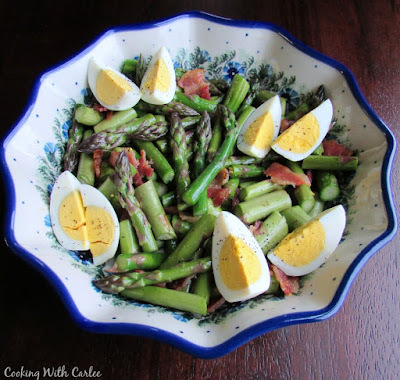 Have you ever tried an asparagus salad? If so what flavors do you like? 1. Steam or microwave the asparagus for just a couple of minutes. You want to soften it just a bit, but still have a bit of crunch. Rinse with cool water to stop the cooking process and then set aside.2. In a large bowl, stir together the Dijon mustard, apple cider vinegar, olive oil and syrup. 3. Toss the asparagus in the dressing and season with salt and pepper to taste.4. Top with crumbled bacon and sliced eggs. I've never had an asparagus salad before. I always roast it or toss it in an egg bake. I love your salad idea! You should change that! You have your very own patch you know. I roast most of mine too, though now I wish I had made a quiche with some! 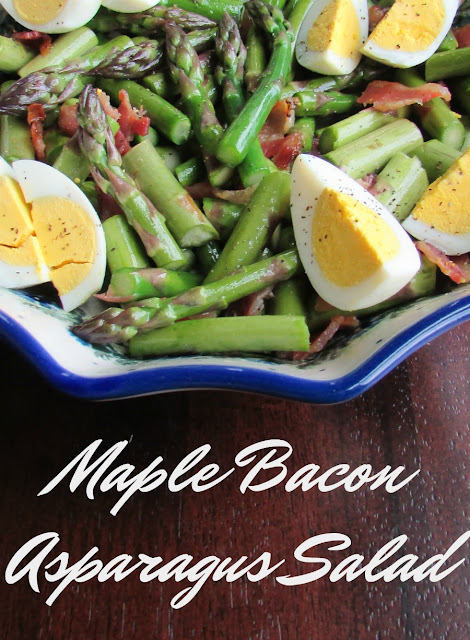 This makes me happy, so I always cook asparagus the same ole way and throw a little parm on top, oh my with the bacon and maple flavor, I bet this takes asparagus to a whole new level and I cannot wait to try this!! Happy Weekend beautiful lady!! I love asparagus with parm!! But I vowed I would try some new things this year! Have a great weekend, Andrea! I don't think I've ever had an asparagus salad; I usually just roast it. But OMG I need to try this! It looks so delicious :). Have a great weekend, Carlee! I roast it 75% of the time too, but thought it would be fun to switch it up a bit this year! Thanks, Kelsie! I do love asparagus! This salad sounds great!! I do too! I always get excited with it starts filling the shelves in the spring. Thanks, Amy! This looks so good. I may have to try it. Hi Carlee, I love the sound of this dressing and I have spotted maple syrup in health food shop in town! Asparagus isn't so easy to come by here as the season seems short, but I shall keep my eyes open for it... Another great sounding recipe! I think that is one of the things I like about asparagus. We can get almost anything year round here, but asparagus is one of those things that I pretty much only buy when it is in season in my region. It is so much better then and it gives us something to look forward to in spring!